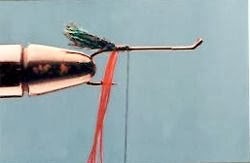 This fly was developed in the 1930’s by Don Godfrey. It was originally used to catch sea-run cutthroat on the Oregon Coast. However, it also became an effective pattern for brook trout, steelhead, salmon and a variety of warm water fish. 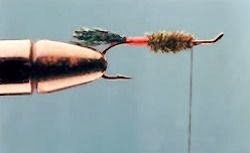 Variations of this fly are the Silver Spruce tied by Polly Rosborough, the Dark Spruce which is a good minnow suggestor, as well as the Red Spruce used for brook trout. 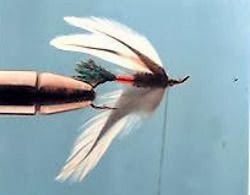 The wings of these patterns can be tied as a feather wing style (matched together as one wing) to suggest the back of a minnow. They can also be tied splay wing style (wings split apart) to suggest a lively motion of a fish. 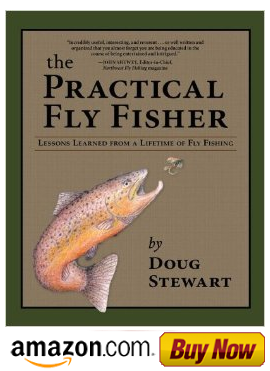 It can be fished effectively using the wet fly swing, casting and stripping or trolling in still waters. I highly recommend it. Step 1. Tie in the peacock tail and attach the floss. Step 2. Wrap the floss up 1/3 and attach the herls. Step 3. Spin the herls up to 3/16 inches from the eye. Step 4. 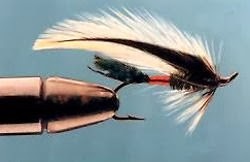 Attach the wings splay style and the hackle. Step 5. 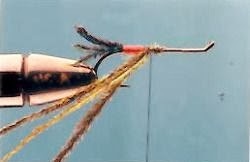 Wrap the hackle up to the eye and wrap over it to form a 45 degree angle. Tie off and finish the head.